With Facebook Live coming in, and YouTube upping its live-streaming credentials, Twitter's Periscope, which was one of the first to jump onto the live-streaming wave, has become an afterthought for many. Once seen as the leading live platform, Periscope has lost priority, seemingly even in the eyes of Twitter itself, which now offers direct streaming via tweet without going through Periscope, lessening the platform's direct usage. But Periscope is still in going - despite various content concerns and niggling issues, the Periscope team continues to roll out new updates and changes. And this week, they've added a much-requested feature - though it may not function exactly as you'd expect. Now, you can add live guests to your Periscope streams - though they will only be able to contribute in audio form, as opposed to seeing them in split video screen. As you can see in the first image above, guest avatars will appear on screen, and they'll be able to speak during the broadcast. 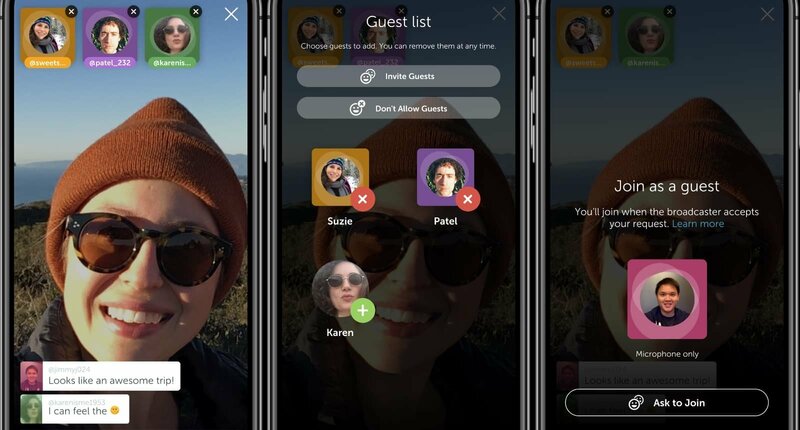 "Starting today, you can go live with guests, and invite anyone in your audience to join your broadcast. Your chosen guests can be heard by everyone and can drop off at any time. Broadcasters can still read and respond to chats, but things get more interesting when multiple people can have a conversation together and share it with the world." So it's kind of what people were seeking. I guess. It's not like Instagram or Facebook Live guests, which, as noted, switch to a full video split-screen. But it's something. To add extra contributors to your Periscope stream, you first need to tap on the 'two faces' icon in the pre-broadcast process, which will enable you to invite guests during your stream. It's hard to say, and because Periscope hasn't revealed actual usage numbers in a long time, it's hard to know whether a significant amount of people are still actively engaging on the platform. But you'd think they must be - you'd assume that, for Twitter to still be investing in the platform, it must see potential. Either way, if you are using Periscope, it's another option to keep in mind.